Some weeks ago in Chicago, for the fourth year, Art On Track took place: a huge mobile gallery on board of a CTA train, that circled in loop for five hours on september 17th to give the visitors a unique experience. Different artist customized each of the carriages, turning an everyday experience into something unusual: not just a boring trip on the way home, but a party of colors and original performances in the same place where we used to see the same grey routine. Every coach was a sort of pavilion where artists could show their works and ideas: someone turned the train into a cosy home, some others made up a fashion show and somebody else built a real garden, almost a jungle, in the small space of the carriage. 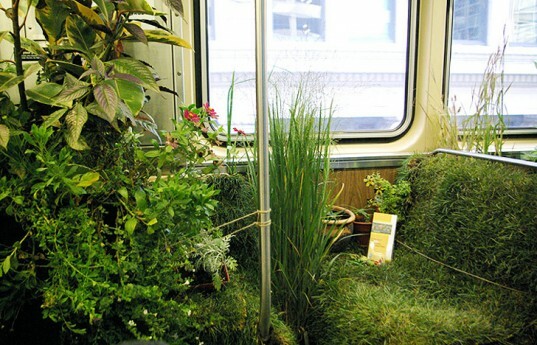 This specific project, realized by noisivelvet is named Mobile Garden. 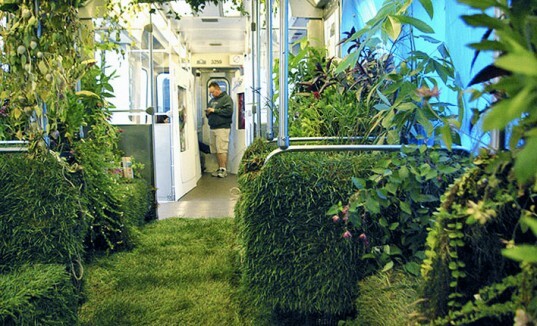 Covering the floor and all the seats with a carpet of green grass, the artists created a nice garden with indigenous plants and flowers spread in every corner of the track and hanging from the top. 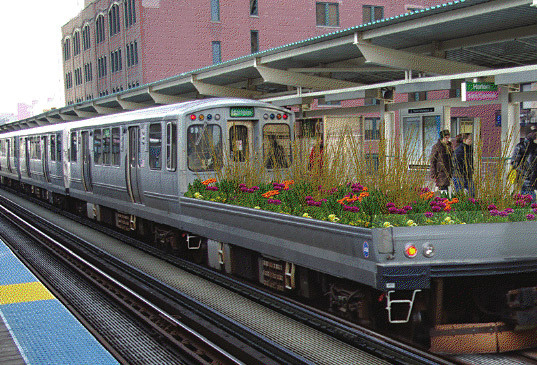 an open-air art installation of a native plant garden pulled behind the L line of Chicago subway for one month. Once tasted this appetizer, we cannot wait to see the big one.